Why should Levi's suicide, in fact or possibility, loom so large in thinking and speaking about him -continuing now, twenty-five years after his death and for many readers who encounter him first only in his posthumous appearance. Why ? Does the matter of suicide alter the reach or meaning of his writings ?... 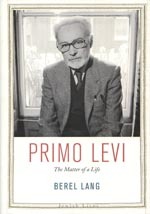 For those who begin thinking about Levi from the last point in his life backward and still more for those who begin elsewhere, his end leaves everything else unaltered and, still more certainly, undiminished. Even as en ending, it demands to be understood as a beginning, with all the reasons for that entry provided first by Levi himself.